It’s so unbelievably easy to get juicy, sweet rhubarb so early in the year. And yet we do it, every year. 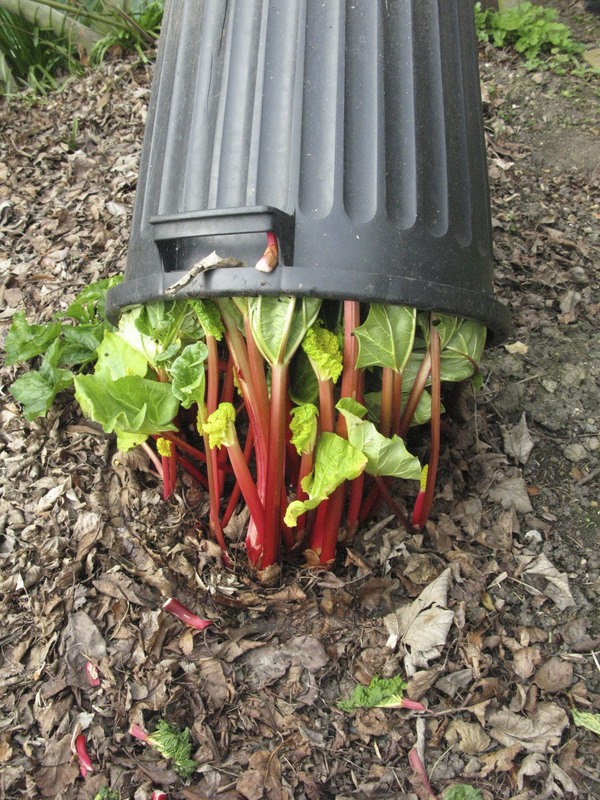 We just place an old plastic dustbin over the new shoots when they appear in early spring and a few weeks later hey presto there’s rhubarb to pick. We generally get too much at a time so it is cooked with a little sugar and stored in the freezer ready for later use. Great with yogurt, on cereal, with ice cream. We made some delicious wine one year, it was a beautiful pink colour. We do bottle some, best for us in the smaller jars, a whole kilo jar tends to languish in the fridge for far too long. Anyway as it has a high oxalic acid content it’s best not to eat rhubarb for extended periods. Once a week is probably wiser. We generally go for crumble or pies, with a generous amount of ground ginger to give it that little extra zing. We have no idea which variety of rhubarb we have, we think it’s been in this garden since the 1930s. But good plants can be purchased from Thompson & Morgan, here is a link to their comprehensive rhubarb catalogue page. ← How to lose weight without dieting!